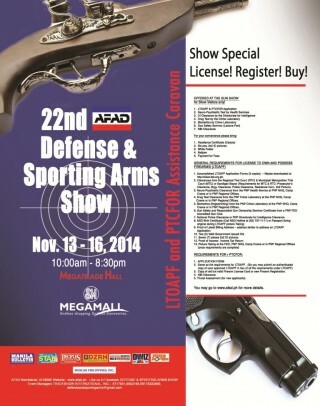 DARC is pleased to announce that we will be at the 22nd Defense & Sporting Arms Show this November 13 to 16, 2014 at the SM Megamall Megatrade Hall 2, Mandaluyong City. Take advantage also of the LTOAPF & PTCFOR Caravan at the show. The PNP FEO, PTCFOR, Crime Lab, Health Services, Directorate for Intelligence will be on site to assist you with your Licensing/PTCFOR needs. Hope you can all drop by our booth to see our product line up and chat with us. Fobus, Mesa Tactical, Magpul PMAGs, FN & KelTec firearms will be on sale! We’re looking forward to seeing you all!